As one Arctic Cat competitor noted, when the new 2012 Cats were unveiled, buyers came out of the woodwork. Based on sales of 2012 models, Arctic Cat marketing just has to hope that snow returns to key market areas as the model year 2012 pre-winter season really did have Cat fans coming out of the woodwork. That has to be bad news for some of Arctic Cat’s competitors, especially when you realize that a number of potential Cat buyers had shifted loyalties. Many former Cat owners just didn’t like the Twin Spar Arctic Cats and they just weren’t buying anything that Cat was selling. But they like what they saw in model year 2012 when Arctic Cat kicked off its 50th anniversary season with a whole new design and a fleet of very appealing sleds. The fact is that Arctic Cat probably could have gained more new owners if it could get more engines. Like Yamaha and other companies that rely on Japanese sourced goods, Arctic Cat just couldn’t get some of the products that make up the new sleds simply because Japan and other parts of Asia were slammed by natural disasters. And, Arctic Cat was playing it cool. While the company felt it had a winner on its hands in the 2012 model line, it wanted to be cautious. Don’t expect Cat to be overly cautious for the future. Arctic Cat saw good consumer response with its ProCross models, like this 2012 F1100 Turbo Sno Pro Limited. 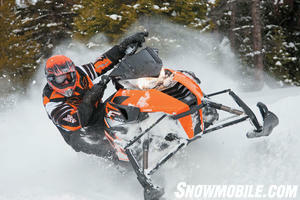 Arctic Cat’s 2012 model mix fits right into the key growth segments of snowmobiling. While the touring, utility and youth segments trended downward, the key segments like mountain and crossover headed upwards with significant gains. Even though the overall growth in trail performance was losing momentum, the 2012 Arctic Cat ProCross trail models gained market share. 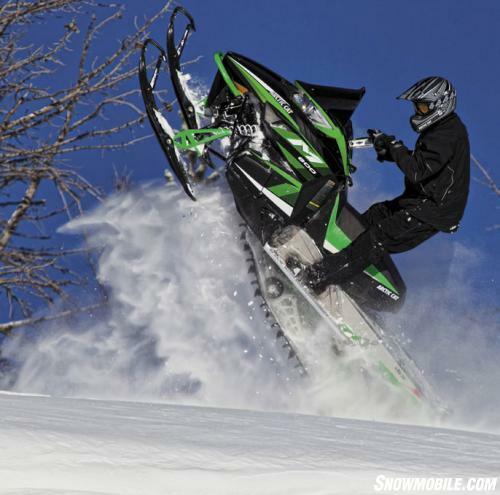 For model year 2013 expect Arctic Cat to fine-tune its position in the industry’s sweet spot. 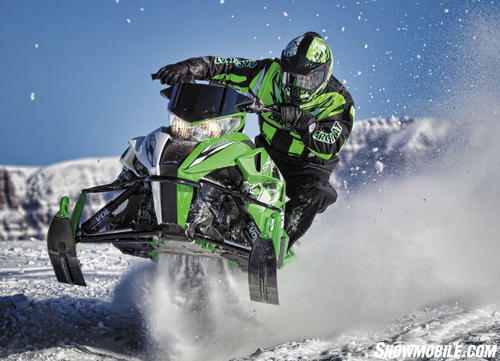 After all, according to Arctic Cat’s Brad Darling, general manager of the snowmobile division, five of the sport’s 10 top selling models were Arctic Cats. The crossover XF800 was the company’s number one seller and the Arctic Cat should end the season as the number one selling brand in four-stroke crossovers. Keep in mind that Arctic Cat’s 600cc category model is actually a one-liter four-stroke and there is also the high-performance one-liter turbocharged version, which was in big demand but in very short supply. Noted Darling, “Our four-strokes were very successful.” Some of that would be due to Arctic Cat’s extremely aggressive pricing versus the category’s more traditional 600cc two-stroke powered competitors. The Cat GM said that the Minnesota-based manufacturer would continue to focus on four-stroke models. Keeping in mind that model year 2014 will see the arrival of Arctic Cat’s own engineered and manufactured snowmobile motors, maybe we have a hint of what the future holds in the engine bay. As for model year 2013, Arctic Cat is all about building on what we saw last season and adding a couple of new models and some interesting wrinkles to build on this past season’s successes. The changeover from Twin Spar to ProClimb chassis powder sleds continues and you will see more evolution than revolution. The ski stance on these models moves in two inches to 38-inches center to center. Cat engineers feel this will enhance side hilling and the rider’s ability to carve and counter-steer in deep and loose powder. This change results from development of new, shorter upper and lower A-arms. The HCR (Hillclimb Racer) retains the 42-inch stance to meet hillclimb rules. Depending on the powder player you want, Arctic Cat offers two variations of its steering post, including one version that continues Cat’s exclusive and innovative telescoping design. You can also expect changes in the spindles to give you tighter turning and more adjustability. Arctic Cat evolved the M-series by moving the ski stance in 2-inches and making weight-saving changes to the rear suspension. For those of you wanting the vertical steering post in your four-stroke deep snow ride, smile. The upcoming season sees all Sno Pro versions of Cat’s four-strokers (except the M1100) getting the same steering as the two-strokes. Western steep-and-deep riders want what they want and many of you like the turning arc of the vertical post as it provides easier counter-steering while standing and running through powder and on sidehills. You’ll also see a PowerClaw track with 2.6-inch lug for 2013. This is a lightweight single-ply track that Arctic Cat’s mountain engineering crew feels works well on its ProClimb models. 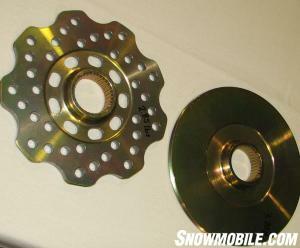 For 2013 all Sno Pro and the HCR M models will offer this track in both 153 and 162-inch lengths. Other changes include cutting some weight from the crossover and standard mountain suspensions via updates to Fox Zero Pro shocks on the rear arm. There you’ll find the Fox shock with coil-over springing to replace the previous dual rear torsion springs. Cat claims ride quality will be unaffected as the new shock was calibrated specifically to ride smoother than the previous Fox Float air shock seen in 2012. 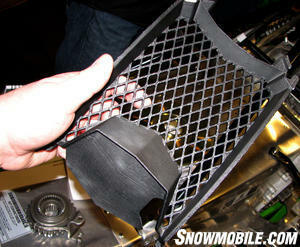 Cat still offers a rear set up with the Fox Float 2 for Sno Pro versions of the XF and M series models. Cat’s engineers feel this “springless” air shock design reduces weight on the rear suspension, yet manages a full range of tuning options for the most demanding riders. 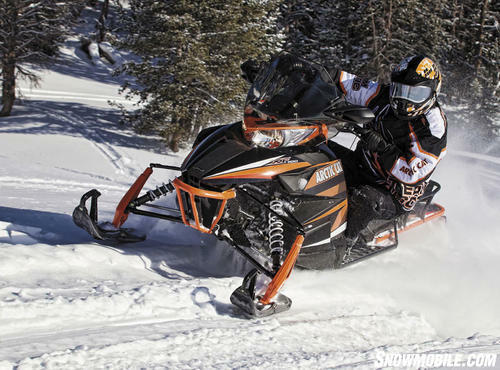 While the 800cc two-stroke will remain a popular choice for the ProClimb models, Cat’s turbocharged 1100 four-stroke remains unique to the Minnesota sled maker and so does its 177 hp at 7850 rpm and 121 ft.-lbs. of torque at 7300 rpm that kicks in at any elevation and temperature. This one-liter turbo motor remains the most powerful production engine offered to date. Built by Suzuki but spec’d by Arctic Cat, the motor features an intercooled turbo system that works off 9 psi of boost. Whether you have this powerplant in a ProClimb or short track ProCross chassis you will feel near instant response as the system’s waste gate control valve regulates intake pressure to maintain boost pressure and reduce turbo lag. In the flat land sleds, this engine is freaky fast yet amazingly docile when sight seeing through curvy backwoods trails. 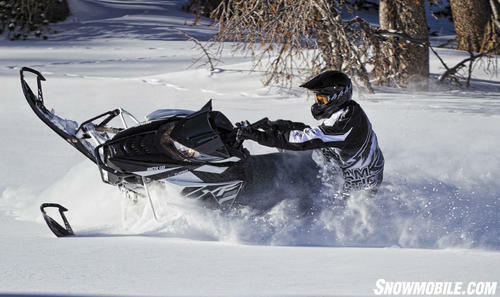 Cat’s Limited models combine the Sno Pro’s performance features with the LXR’s plus-features. Look for the ProClimb series to include all your 2012 favorites but with some serious evolution. There will be M-series with 1100 turbo power as well as the 800cc two-stroker. 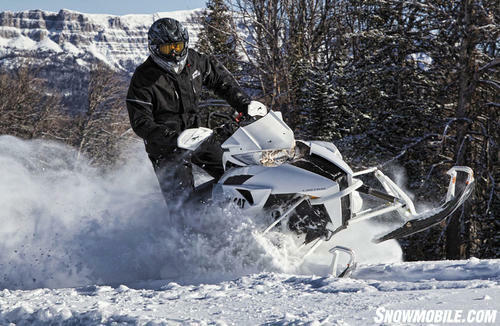 As in past seasons, these models come in various states of dress: the Sno Pro designates models with more aggressive performance pieces; the Limited version adds more civility to the performance Sno Pro model by adding touches like electric start, extra onboard storage, and even adds a heated seat for Turbo buyers. The HCR returns with a choice of turbo or 800 motors to power its 2.6-inch lug height track. A new model, Arctic Cat’s 2013 Cross Tour counters Polaris’ Adventure. Based on the XF “mid-length” chassis, the Cross Tour features a 141-inch track that can be powered by the turbocharged four-stroke, the normally aspirated 1100 four-stroke or the popular 800cc two-stroke option. The Cross Tour may seem to be a duded-up crossover with all the goodies — electric start, bags, cargo rack, mirrors, and high windshield — but in can be transformed from solo sport cruiser to touring duty by simply adding an extra seating option. Arctic Cat expects this extended seating will make the Cross Tour a popular purchase in the Scandinavian market. The new Cross Tour is based on the XF platform and brings great versatility to the trail — or off-trail. As with the ProClimb models the base XF family includes performance-oriented Sno Pro, LXR and luxury-appointed Limited models equipped with a trail-tuned “slide-action” suspension. Springing forth from the XF model line is a backcountry marauder, the High Country and High Country Limited. This XF derivative will only come with a choice of the turbo or 800 engines. It parts with the XF trail orientation and draws upon “M” features. Its ProClimb derived chassis is the same length as the ProCross but you’ll note it spins a 141-inch track with off-trail 2.25-inch tall grippers. It’ll have the trail preferred 42-inch ski stance and full length cooling extrusions. The High Country uses a stretch chassis based on the M-series to give back country explorers greater versatility. It’s all about performance with the Race Replica (RR), which brings race suspensions, braking and style to the world of high-performance. In 2013 you can get your own replica race sled right down to the green on one side and white on the other side styling. Of course, if you’re not showy, go for either all green or all white. Since the “naked look” around the steering post proved unpopular on 2012 models, Arctic Cat added this pop-in vent to add a more finished look for 2013. The new for 2013 F800 Sno Pro RR is equipped with competition-spec components that include: Fox Float EVOL X ski shocks; reinforced runningboard edgerolls; and the race-version Slide-Action rear suspension with remote reservoirs and clicker adjustable Fox Zero X shocks. You’ll get a racer ride as the RR front and rear suspension come calibrated with the same specifications as the cross-country Sno Pro race sled. For race-quick stopping the RR features the complete RMC race brake system, including power-enhanced 9/16 master cylinder, lightened disc and race pads. Base power is the 160-hp 800cc two-stroke twin featuring batteryless EFI, electronic APV valves and Exhaust Pipe Temperature Sensor. With solid sales in the trail sport category, Arctic Cat focused on making its second-year F-series better. One approach was to “clean up” the console area. As one Arctic Cat spokesman told Snowmobile.com, the open “naked look” around the steering column and gauge of the 2012 was not popular. This season that area has been closed off with a snap-in vented panel. Of course, it pops right off if you want to add a bag that permits warm air from under the hood to keep your goggles or spare gloves warmish. It does add a more finished look to that area. The Race Replica uses a full-on lighter weight and ventilated racing disc versus the standard version at right. The F-series base four-stroke was Arctic Cat’s trail sports bestseller in the 125-hp category thanks to the solid performance of the torquey, ultra-clean 1100cc engine and the combination of exceptional handling and control from the ProCross chassis. The F-series enters 2013 with only minor changes. It retains the ARS front suspension with the extra-tall spindles, wide A-arm spacing and one-piece ski spindles. Balancing the handling is the FastTrack Slide-Action rear suspension. The F-series offers a choice of the 1100 four-stroke, turbocharged 1100 or the 800cc two-stroke to work with the Arctic Drive System. You’ll find a sampling of F-series models designated for high mileage comfort (LXR), aggressive trail (Sno Pro) or the best combination of the two offered in the early season as special Limited versions. If you liked the older chassis 2012 Twin Spar models, you won’t find much has changed on the 2013 versions. The Bearcat, Z1 Touring, F570 and F500 will have minimal changes. Change is minimal in 2013 for the Twin Spar models like the F500. The Sno Pro 500 “school boy racer” dates to the 2008 race sled and will continue as the starter sled for developing future snocross and cross country racers. Arctic Cat offers specific setups to control engine performance for the 10-13 year old class of rider. This is Arctic Cat’s sled to feed new riders into the various racing circuits. Feeding new riders into becoming Arctic Cat owners seems simple enough. Continue what worked for 2012 with the ProClimb and ProCross Cats. This past season was one of the best sales seasons in recent memory for many Arctic Cat executives. 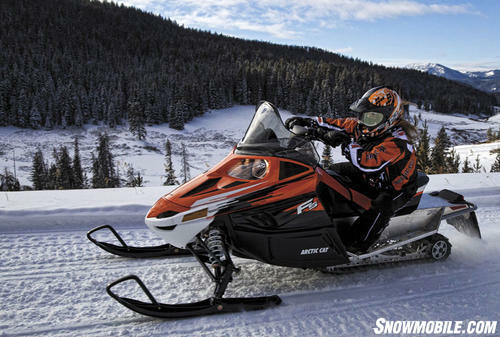 While the lack of snow may have slowed sales in the final months of winter, it was early sales that proved that Arctic Cat is on the right trail. The 2012 Arctic Cats were a sales success and 2013 brings more of the same, with a few twists to ramp up continued enthusiasm.